Soft Tension and Dual are the two latest releases from Andrea Maack, an Icelandic multimedia artist who established an independent perfume line in 2011. Both are inspired by Icelandic landscapes. Soft Tension is a "sensual white musk inspired by a thick mysterious fog," and Dual is "inspired by the calming water of the natural hot springs in the Icelandic highlands" and "mimics the feeling of fresh water on the skin and the intense color spectrum surrounding the hot spring lagoons." I've never traveled to Iceland, but I've heard fascinating accounts from friends who've been there. Would Soft Tension and Dual provide an olfactory substitute for a Nordic getaway? I tried Soft Tension first, dabbing on a few drops and preparing to inhale its notes of freesia, musk, mate absolute, cedar and moss as I imagined a dense mist over descending over waterfalls and lava fields. Unfortunately, what I got was just a hint of the freesia (cool and sweet) before I ended up with a linear grapefruit-and-musk composition. The dry down has some cedar, but the all-over effect is thin and sharp, rather than "mysterious" and all-enveloping. All right; how about Dual, with its promised notes of ginger, lemon, pink pepper, amber and cedar? I thought I'd be inhaling paired cool and warm accords with something earthy underneath, and I got ready to picture myself dipping into one of Iceland's famous natural hot springs under an otherworldly sky. Alas: Dual is more substantial than Soft Tension, but not very complex or evocative. There's a fuzzy ginger top note, and then it's primarily a very "dry" pepper-and-cedar scent. It's fine, but it doesn't live up to its promises (or its price). Soft Tension and Dual are both unisex, and they have average sillage and staying power on my skin. They could probably be layered if you so desired. They're contemporary in a very inoffensive way. Overall, they seem to follow the path marked by Escentric Molecules and recent Comme des Garçons releases, whereas I expected something more along the lines of Blackbird Triton or Olfactive Studio Lumière Blanche. I think I need to go back and revisit some of Maack's earlier perfumes, since I remember them as being more layered and creative than either of these new releases. In the meantime, I'll content myself with looking at photos of Icelandic landscapes online. Andrea Maack Soft Tension and Dual are both available as 50 ml Eau de Parfum ($135). For buying information, see the listing for Andrea Maack under Perfume Houses. 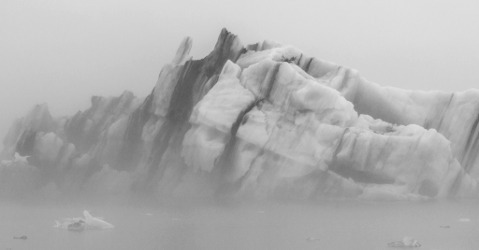 Note: top image is Foggy Iceberg at Glacier Lagoon [cropped] by Tim Sackton at flickr; some rights reserved. I really do need to revisit the earlier releases. They wouldn’t have stuck in my memory if they hadn’t been more intriguing than these! Soft Tension is a memorably awful perfume name! I would love a perfume like an Icelandic landscape too, but these sound like ones to miss. I guess it’s meant to be a contrast, an oxymoron? I don’t quite get it…. I gave this both a quick sniff recently and wasn’t moved by either and I also don’t like the new bottle style as much as the old ones. I do love and own Coven.